UFC double weight world champion Daniel Cormier has had the pleasure of providing six samples to USADA in as many weeks. 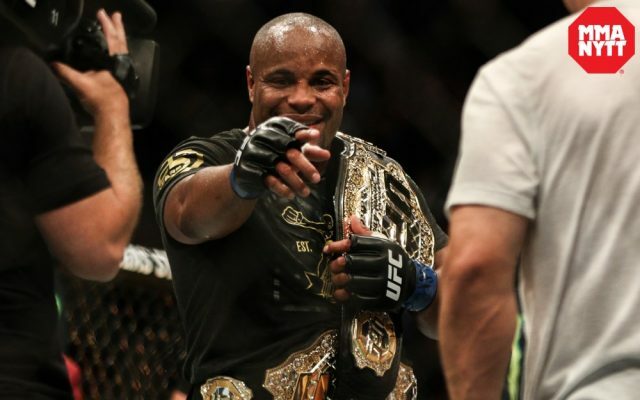 Daniel Cormier might be getting sick of the sight of USADA turning up on his doorstep having provided six samples in as many weeks since defeating Stipe Miocic for the UFC heavyweight world title at UFC 226. The double weight world champion has been visited three times by USADA officials since the fight and would have almost certainly provided both blood and urine samples on each occasions. According to records kept by Twitter user @Dimspace, plenty of fighters have been visited twice by USADA in a week e.g. Claudia Gadelha and Donald Cerrone, but the only other example of a fighter being tested as much as Cormier over the past few weeks is Dan Henderson who was tested in a similar pattern during Q3 2016 after he announced his retirement. The latest batch of data from USADA has now seen Cormier rise to the top of the table for ‘most number of testing sessions’ completed by a fighter since testing begun. Yoel Romero tops the table for ‘most samples provided’ all time and in 2018. Also of interest this week, Chris Holdsworth was tested for the first time in 2018. The Team Alpha Male (TAM) fighter hasn’t fought since 2014, but still to this day remains in the testing pool. Chad Mendes was recently asked about a possible return for his teammate and coach Holdsworth, but he declined to comment stating that it hadn’t been discussed and that Holdworth was currently happy fulfilling his duties as one of the head coaches at TAM. Following the reports that Jon Jones has not been tested for 42 weeks, the former UFC light heavyweight champion was visited by USADA for the first time since mid-October and provided both a blood and urine sample. All data and tables supplied by: @Dimspace.